A complete golf cart front seat replacement kit including the seat bottom and seat back or backs with new vinyl seat covers in a single or two-tone color. --Conforms to factory measurements for the Club Car, E-Z-GO and Yamaha golf carts. All older models from the Club Car DS, 1984, E-Z-GO Marathon and the Yamaha G2/G9. Seat replacements are not available for the G1 bucket seats. --The assembly includes the plywood backing, polyethylene foam, T-nuts, and vinyl seat covers. --Comes in universal white or the off white beige colors. --Vinyl is available in other colors like black, grey or red and in many two tone combinations. Please call Customer Service for these options.This special colors are not returnable because they are all custom made. --Seat backs are in one or two pieces to confirm with the original design. --The seat assembly does not include the hardware or arm rests. You would use the original hardware. --Come with marine grade vinyl seat covers. --Can come in a thicker heavy duty commercial grade vinyl in the single colors of white, tan, buff, or beige. This commercial grade is not available in other single colors or in the two-tone covers. The commercial grade is popular with golf courses where heavy use tends to wear out the seats faster. --Dimensions conform to original factory specifications. 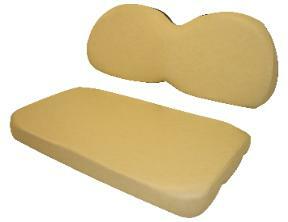 --A kit of plywood, foam and T-nuts only is also available without the vinyl seat cover. Seat bottom can be sold separately. Matching rear seat replacements are also available.We would need the bottom and back measurements. If the measurements are different than the front seats, there is an extra charge of $20 for a single color and $24 for a two-tone color. Below is a customer's new front seat assembly replacement on an old style Club Car in the Club Car Buff color. This cart also has our Club Car fold down rear seat. The seat replacements also come in 4 camouflage patterns of Cordura Real Tree Xtra and Mossy Oak Breakup and in vinyl Hidden Creek and Hidden Creek Marsh. Below is a seat in Hidden Creek Marsh on an E-Z-GO TXT. Please allow 1 week to ship the seat replacement.